In August of 2016 our family was attending a birthday party at a trampoline park. Everyone was having a blast. Our son Mason took a little spill and started crying as he had hurt his leg. It was the end of the party and nothing serious, so we packed up and headed home. Mason complained about his knee hurting. Assuming he twisted it, I had him laid up on the couch to rest the knee. The next day when he said it still hurt I told him we will have to go to the doctor to have it checked. He said, “no its okay” and started walking on it again. 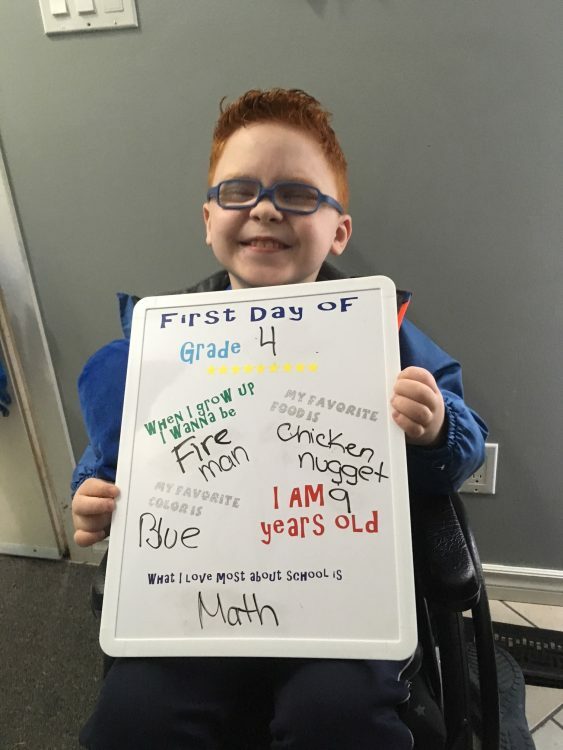 Mason was diagnosed at age three with autism and he was not a fan of unknown places like the doctor’s office and the thought of getting X-rays terrified him. He also had a speech delay, so there was a communication barrier to work through that made it tricky in these situations, as he didn’t have the words to explain what he was feeling. 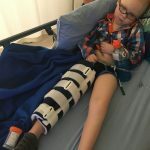 After nearly two weeks, he woke in the morning and was crying about his leg again, so I called my husband Josh and said that we should take him to see a doctor. I was thinking that school was beginning shortly and maybe there was a small fracture, or something was torn. Josh got home from work and took Mason to our local urgent care. It was a long wait, so I brought the other two kids and we switched out. He took them home to bed and to get some rest himself since he had to work in the morning. I stayed with Mason. The doctor came back in and said his X-ray looked fine but that they wanted to do some blood work. A couple more hours passed and they returned to tell us that the tests that came back looked okay and that we were free to go home. The doctor said, there was one other test but it was sent to the Calgary Lab Services and since it was now past midnight they would not get anything back tonight. I packed up Mason carried him to the truck and remember having this sinking feeling. Clearly something was wrong. Mason is a tough cookie and never complains unless there is indeed something hurting him. As I drove him home I remember thinking I should just drive straight to the children’s hospital, but I looked back at Mason in the rear-view mirror and thought I better take him home for a good night’s sleep. That was it. One phone call changed our life…our family’s life. I just sat there so confused and then it started to sink in. I called Josh and asked where he was. He said on his way. In a haze still, I said “Hun, the lab called and they say Mason has Leukemia.” I’ll never forget the way Josh screamed. It was as if I could hear his heart break. I heard my mom come in the house. I walked up to her and told her. We were both so confused and just hugged. It was such a surreal moment that it just couldn’t be real. Josh came home, we packed up to head to the hospital and began our journey. 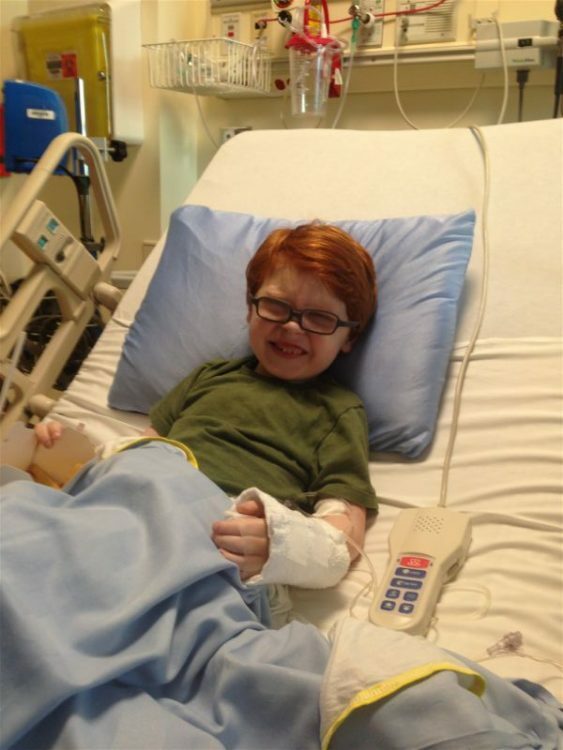 After more tests, it was confirmed that Mason had pre B acute lymphoblastic leukemia (ALL). After that moment, it was information overload. So many doctors talking to us and telling us what will now happen. Mason was diagnosed on a Thursday with plans for surgery to place his IVAD (implanted venous access device) in his chest on the Monday. We used that weekend to have all the family visit before treatment started. It was so overwhelming. 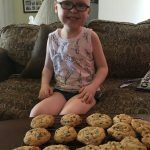 To start, we were to only focus on the next 29 days, as that was the time they would hit his body with a heavy dose of chemotherapy in hopes that he would go into remission. His first bone marrow aspiration showed that 75 per cent of his cells were leukemic. After the 29 days, if his cells were less than 0.01 per cent leukemic, he would be considered in remission. 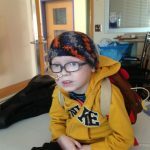 On what should have been Mason’s first day of grade two, he was instead receiving his second dose of chemotherapy in the hospital. It was a long and hard 29 days. 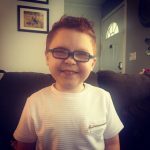 Mason was in a lot of pain, he was weak, started to lose his hair and though most kids eat a lot in the first month, due to steroids, Mason did not want to eat and was losing weight fast. On day 29 he had another bone marrow aspiration. The next week we came in for blood work to see if Mason was strong enough to start the next round of chemo and to get the results to see if he was in remission. I remember being so positive that day and thinking how will I explain to everyone that remission does not mean cured and that we still must be careful. 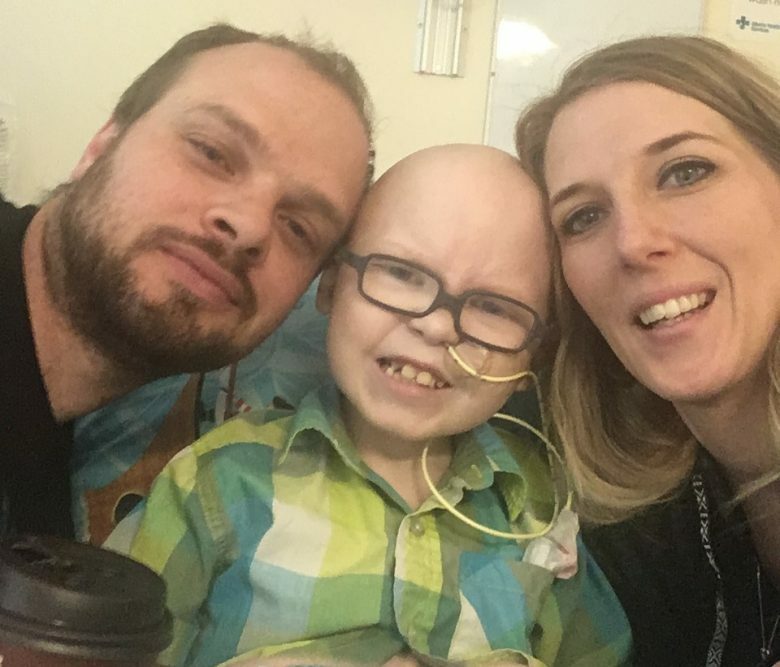 My positivity quickly vanished as our oncologist and primary nurse sat us down and told us that Mason did not go into remission and that there were still leukemia cells detected. That hit me hard, almost harder than the first time. I burst into tears and I remember little Mason reaching over to comfort me and telling me it was okay. 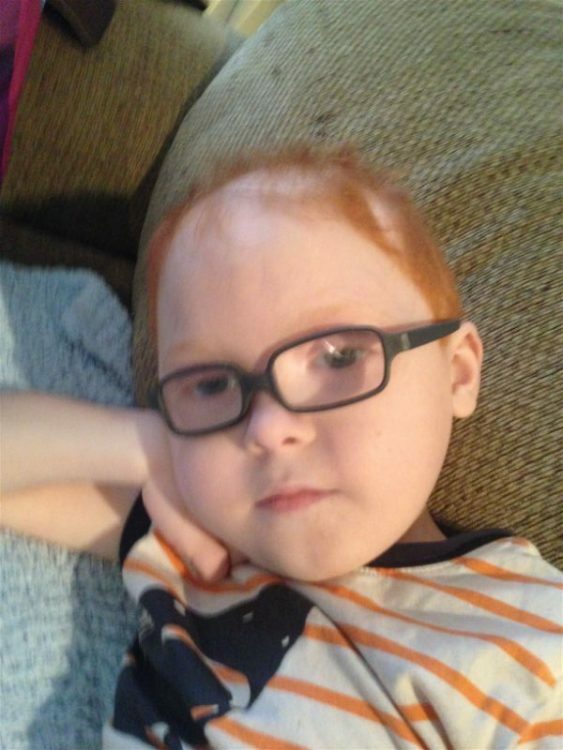 Mason was now bumped to high risk and would start a stronger round of chemotherapy. 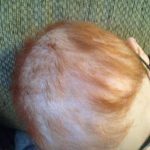 This phase was called consolidation and it would be two months of treatment with the goal of hitting remission. If not, the next step would be a bone marrow transplantation. This round of chemotherapy was ruthless on Mason. He lost over 30 per cent of his body weight due to lack of appetite and continuous vomiting. 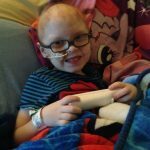 He needed to have a NG tube placed to make sure he was getting the nutrition his body so desperately needed. 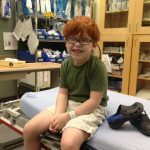 For a kiddo with autism and sensory issues, the NG tube was one of the most traumatic things Mason had to endure. It would take three to four of us to pin him down so that a nurse could safely insert the tube up into his nose and down into his stomach. 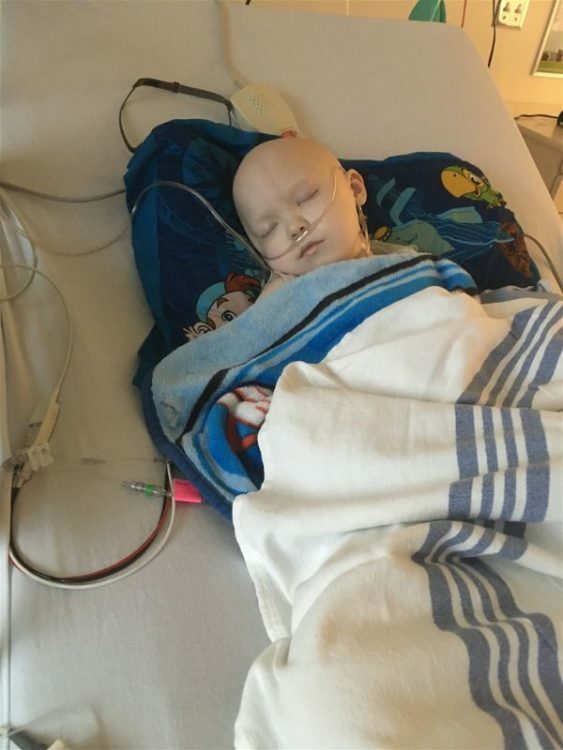 This round of chemo also hit his other blood cells very hard and Mason needed many blood transfusions. 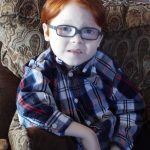 He has had 26 blood transfusions to date actually. Low platelets were very scary as he would bruise easily, and blood vessels would break. Physically, this looked very scary. One morning I woke to find him with dried blood coming from his nose and ears. Finally, after this period, Mason’s bone marrow showed he finally hit remission. It was Christmas Eve when our oncologist called to share the great news. We were so overjoyed. The next phase was two months of what’s called interim maintenance, a phase to maintain remission and focus on preventing central nervous system (CNS) disease. 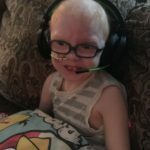 This was most likely going to be Mason’s easiest phase, but he still relied on his NG tube for nutrition as by this point had stopped eating and drinking entirely himself. Blood transfusions were still needed and we had many hospital stays for fevers and illness. It was during this time that we started to become concerned that Mason could not walk anymore. This can be common to have joint pain or get clubbed feet, but my gut told me there was more to it. I had learned to follow my gut over the years with Mason’s communication barriers. Some doctors thought his not walking may also be behavioural, but I disagreed, and an MRI was ordered to rule anything out. 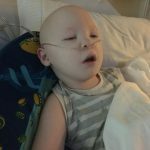 On February 14, 2017, Mason had his first MRI, which showed us that he was suffering from avascular necrosis, which is basically no blood flow going to the bones, causing the bones to begin to die. This can be a side effect from the steroids, but is usually not seen until far later in treatment – never after only one month of steroids. It was nice to know what was happening, but being so early into his treatment, it was scary. We knew we had another big phase of steroids coming up. They had started Mason on a medication to try to protect his bones during the next phase: delayed intensification. This was a more intense phase that would aggressively attack the leukemia cells, but other cells too. We had to cross our fingers and pray as it also came with more steroids that could hurt Mason. The risk was too high to not move forward. Mason did surprisingly well with about the same expected side effects. We even got rid of his NG tube as he started to eat again. It was May of 2017 now and he was receiving his last doses of chemotherapy for this phase. We had done it! We were finally through the thick of treatment and I jumped for joy that day. 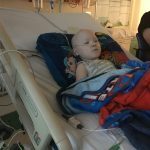 The nurse called shortly after and said his counts showed that he needed a blood transfusion, but that it was safe to wait until the following day. However, the mood soon changed. That night Mason wasn’t himself and ended up sleeping in my bed. All he whispered back was, “I miss you, Mommy.” The ICU team rushed and started assessing. There were so many people surrounding my son who looked so lifeless that I just stood back and watched. It felt as if I wasn’t even there, everything was moving so fast around me, but I felt I was in slow motion. Josh found us in the ICU where they had stabilized Mason. That night will forever haunt me. We were transferred back to the oncology unit and stayed there for a total of 14 days. Mason had to get an NG tube placed again before they would let him go home, but when he did come home, we were so happy. Two weeks later we finally hit the maintenance phase, which is much less intense and about two and a half years long. 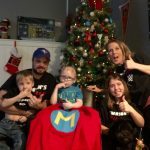 We had a big eighth birthday celebration for Mason in July 2017 and to celebrate him reaching this phase. 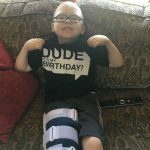 We had planned a pool party, but due to the side effects to his bones, Mason fractured his femur trying to simply stand and spent his party in a cast, but it was still a great party. We were first introduced to Kids Cancer Care during Pizza Night at the hospital, which Mason absolutely loved. Although Mason hasn’t been able to personally take part in any programs outside of the hospital yet, what I love so much about Kids Cancer Care is that they do not forget the siblings in this journey. The cancer diagnosis pulled the rug out from under our whole family. Our other son and daughter worried a lot and were confused about Mason’s diagnosis. 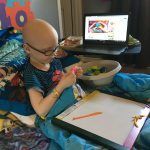 I enrolled my daughter in a Kids Cancer Care camp about a year after diagnosis and I am so thankful I did. It was the most memorable experience. She connected with other kids who were on the same journey as us and it gave her a place to belong. She attended camp again this summer, and again, she was on cloud nine! I cannot thank Kids Cancer Care enough for not only having programs for Mason, but for his siblings too. 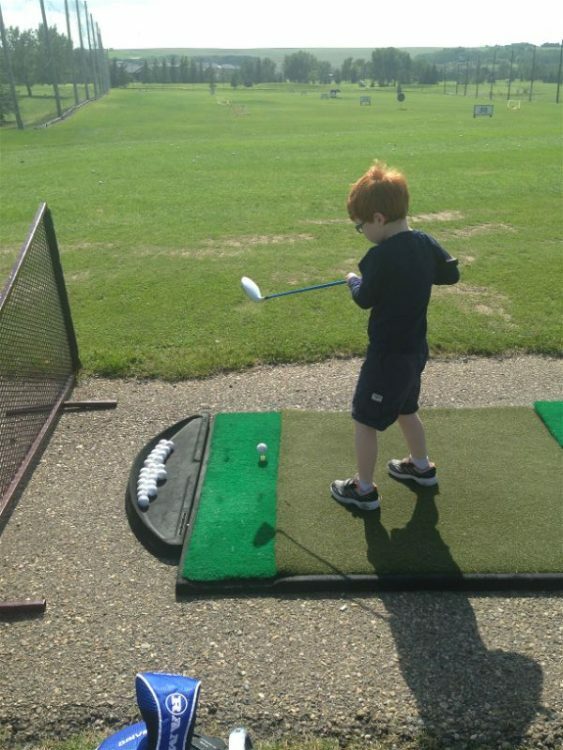 With Mason getting stronger each day, I know he is so excited to join his sister for the next camp! He continues to struggle with his mobility and is in a wheelchair full-time, but he is working on using a walker more. He recently had a small fall and fractured his hip. From being bed ridden for two years, he has developed mild scoliosis and now needs to wear ankle foot orthosis (a brace) all the time. He also needed surgery this past April on both feet to stretch the tendons. He is in physical therapy and working hard to get back on his feet again. Mason has been through the wringer, but he continues to push through and he does it all with a smile on his face.